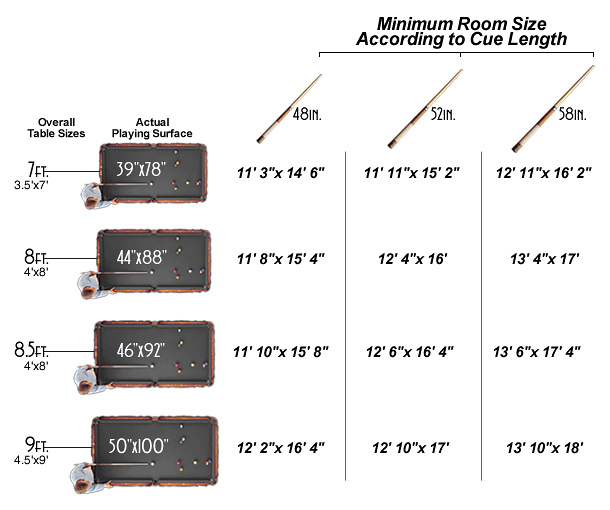 With this in mind, we’ve created a simple “room size chart” that will help you choose the pool table size that’s best for your playing area. For some homeowners with less available gaming space, a 7 foot pool table is the right choice. Many times, a shorter cue will enable these sorts of homeowners to fit a larger table in their allotted space. As far as new pool tables we sell and service, the 4′ x 8′ is by far the most popular size pool table for game rooms. A standard pool cue length is 58″, so be sure to keep in mind how much room you’ll need in order to play each angle on your table. We hope this room sizing chart makes your decision a bit easier! We are here to help, so by all means let us know if we can answer any specific questions or show you examples of each size pool table. If you have any questions about room dimensions, cue length, or table size, don’t hesitate to contact us! Call us at 804-355-6588, contact C.P. Dean online or come by our new showroom and service facility at 2044 Westmoreland Street, Richmond, VA 23230. We welcome the opportunity to answer all your questions and to point you in the best direction relative to your new pool table!